We’d love your help. Let us know what’s wrong with this preview of It Looked Different on the Model by Laurie Notaro. To ask other readers questions about It Looked Different on the Model, please sign up. 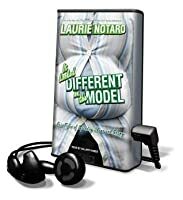 I love Laurie Notaro's unique sense of humor and her non-fiction books are so much better than her fictional ones because of the goofy stuff that happens to her on a daily basis. This book is a funny fast read that helped get me through a trip to the DMV to change my address on my license (I was the only person having fun there), as well as, my daily commute this week. - Getting banned from the post office aka "The Two-Cent Stamp Bandit"
- Oh and last but not least, the dog bark translator. A must read for anyone with a wicked sense of humor. WARNING: Do not read this book while you are in the doctor's office waiting room. You will either be laughing so hard that the receptionist will think you are having a seizure or you will be asked if everything is all right since you are crying. The book is quite funny and trying to not laugh out loud is next to impossible. Everyone can relate to at least one chapter in the book. A great read when you are feeling overwhelmed with work, the economy, the kids, etc. Pretty funny book. I had fun listening to it while I worked. I think people were wondering why I was laughing sometimes. I’ve pretty much read every Laurie Notaro book, and as usual, this one did not disappoint in the least. In fact, I would say that this is one of my favorite by her. She is hilarious. If you enjoy Jen Lancaster, this is no way you can’t enjoy Notaro and vise versa. The situations that Laurie gets herself into are too funny, I found myself laughing on several occasions while reading this book. They are also situations that one can see themselves getting into. For the most part, they aren’t over top, making her very relatable. I would recommend this for anyone looking for some humor. It’s a fun, quick read. I know I had trouble putting it down. I was even disappointed that sleep finally took over at several points (being super sick and on sleepy meds does that) because it meant putting down the book. 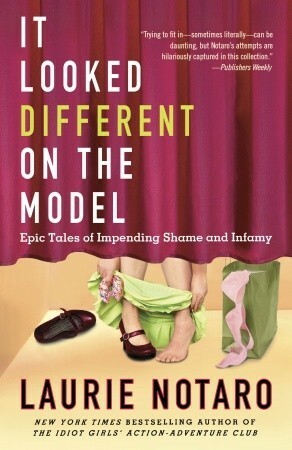 I look forward to her next book being released this coming week (on 5/7/2013). Ambien shenanigans. Tweekers falling asleep on your front lawn. Getting into a fight with a size “M” shirt at a boutique store — and losing. All just moments in the life of Laurie Notaro, a humor writer transplanted from sunny Arizona to the hippie-laced suburbs of Oregon. And in her latest memoir, It Looked Different On The Model, Notaro welcomes us again into the zany world that is her no-holds-barred brain. Notaro has been my hero for quite some time — and though I couldn’t get into her recent Ambien shenanigans. Tweekers falling asleep on your front lawn. Getting into a fight with a size “M” shirt at a boutique store — and losing. All just moments in the life of Laurie Notaro, a humor writer transplanted from sunny Arizona to the hippie-laced suburbs of Oregon. And in her latest memoir, It Looked Different On The Model, Notaro welcomes us again into the zany world that is her no-holds-barred brain. Notaro has been my hero for quite some time — and though I couldn’t get into her recent novel, I’m still a huge fan of her true-to-life, hilarious stories. No one makes me giggle like Notaro, and some of her scenes in this one — especially those including “Ambien Laurie” — will forever be embedded in my brain. Her line about a monkey rooting through purse trash? Comedy gold. That being said, is this Notaro’s finest work? Nope. Laurie is at her best when she’s making fun of herself and relating stories of “impending shame and infamy,” as her title suggests. The only problem here is that while a few of her recent tales had me in stitches, the vast majority just sort of . . . rambled along with no real goal or intention. Just between you and me, friends, I may have skimmed over a few. Like the open letter to her alleged iPhone thief? I mean, I love my phone — I really do. But page after page of that drivel? Eh. But I still love you, Laurie — and I still desperately wish you could be my BFF. We’d make snarky comments about our neighbors and speculate over which crazy acquaintance is really a drug addict and gripe about our weight. It would be a grand old time. One of the reviews I read said that Notaro has sledgehammer humor (or something to that effect). Nothing is treated subtly. I agree. But I think the problem with reviews like this is more the way the reader *read* the book, and not so much with how the author *wrote* the book. Here's what I mean: The book is not a novel. It is a series of humorous anecdotes and rants. If you read the book all at once, the way you'd read a novel, it *does* run together and get old. But I do not believe that's the One of the reviews I read said that Notaro has sledgehammer humor (or something to that effect). Nothing is treated subtly. I agree. But I think the problem with reviews like this is more the way the reader *read* the book, and not so much with how the author *wrote* the book. Here's what I mean: The book is not a novel. It is a series of humorous anecdotes and rants. If you read the book all at once, the way you'd read a novel, it *does* run together and get old. But I do not believe that's the way the book works best. It is meant to be dipped into, one little bite at a time, and then put down, to be picked up again a couple of days later. Read that way, Notaro's sarcastic humor is *funny* and not wearing. Laurie Notaro is a gift to all our feminine insecurities. She gets to the heart of the matter, slices it to pieces and exposes it with raw humor. The next time I try on clothes at the boutique, I'm not going to leave feeling defeated because I left my best body years ago. I'm going to giggle, remembering Laurie's recollection of her dressing room experience. I convulsed with laughter six pages in. Just a word of warning, pee before reading. That's how funny she is! I'm going to say this one more time. Jenny Lawson had ruined me for any kind of female memoir book! I can't give a plot summary of this book because I didn't get past page 27. There are some books that don't grab my interest right away, but I keep reading to see if I am missing something; or I put it aside and come back later when my mind is cleared. I want to give it a fair chance, and very often, I am glad I did. This book was a disaster for me. At the beginning (and keep in mind, I didn't get much past that) Laurie finds herself stuck in an adorable blouse, marked down to a bargain price, bu I can't give a plot summary of this book because I didn't get past page 27. There are some books that don't grab my interest right away, but I keep reading to see if I am missing something; or I put it aside and come back later when my mind is cleared. I want to give it a fair chance, and very often, I am glad I did. This book was a disaster for me. At the beginning (and keep in mind, I didn't get much past that) Laurie finds herself stuck in an adorable blouse, marked down to a bargain price, but too small. Ok. I have had a zipper get stuck or I have had a pair of slacks that just didn't quite make it past my hips. It is frustrating, embarrassing, and disappointing. So that part seemed real and I could see the humor in the situation. The problem was, the escapade went on and on and long descriptive imaginary dialogue between her "nice voice" and her "mean voice". Laurie ends up buying the too small, by then bloody blouse due to her struggle and a too small slip as well to cover up for her battle in the dressing room. This was the first book I have read by Laurie Notaro and I have to say I was pleasantly surprised! I laughed out loud at several parts- which was a bit awkward since I was at the Dentist Office waiting for my sons' teeth to be cleaned... Thoroughly enjoyed and totally got her humor! Love the picture at the end of the book - with Blu the Ox - as I have sons - I can totally see myself forcing them to do the same thing! Definitely recommended and am looking forward to reading more from this author! I've loved most of your books, except your last fiction book. I was very excited that you were putting out another collection of humorous short stories. However, I felt that some of the stories in this book were a bit lacking. There were plenty of funny ones, sure, but a couple of them were very tough to follow and didn't make a lot of sense. I would give this book lower, but it gets three stars because it did have a few stories that made me chuckle. Well, maybe I shouldn't say "read" because I didn't finish it. I keep looking for what I enjoyed in "The Idiot Girls' Action Adventure Club". Why can't I find it??? It makes me wonder if I was right about it after all. I did enjoy the first few stories in this one more than I have her last few books in total, but they weren't enough to keep me reading and I still felt a little let down. :( Bummer. Oh my gosh, I laughed so hard at times that i snorted. Bad bad funny, LOL....it had some seriously lacking parts but the hilarious parts far out weighed them. Laurie Nature is a wonderful author, when reading her books it reminds me that I too have had a shirt attach me in the trying room. She is the type of author that I would love to be friends with. I think if would be a lot of ... Me "you are not going the believe what happen to me today." Notaro "Oh try me Amber just try me." What a highly entertaining & hilariously relatable book! I hadn’t heard of Notaro prior to picking this one up, but I’ll definitely read more of her works. That Laurie...some of her stories really make me laugh! Well, anyway, these days we all can relate! Perhaps this book IS hysterical. Definitely laugh-out-loud funny. I feel sympathy for Laurie Notaro because her internal voices are MEAN. She's a tough cookie, though. She can handle it because her family raised her to handle almost anything. Warm yet ruthless. I was browsing for books at Borders about two years ago. A young salesgirl asked me if she could help me find anything. I told her I was just browsing and she told me that she really enjoyed books by Laurie Notaro. I did write her down in my book where I list books to read and I must say that I found the titles of her books very interesting. Since I was making a long drive, I like to have a book on CD to help pass the time. My daughter was going with me so I needed one that would interest both o I was browsing for books at Borders about two years ago. A young salesgirl asked me if she could help me find anything. I told her I was just browsing and she told me that she really enjoyed books by Laurie Notaro. I did write her down in my book where I list books to read and I must say that I found the titles of her books very interesting. Since I was making a long drive, I like to have a book on CD to help pass the time. My daughter was going with me so I needed one that would interest both of us. When I saw that this one was available I figured it would be perfect for us. Another fun book from Laurie Notaro! The chapter where she realizes that size M and an L are very different and her dressing room antics had tears running down my face! And who hasn’t gotten those FWDFWDFWDFWD from your parents or in-laws with every hoax available to man and no matter how many times you tell them it’s a hoax they still send them along to you! Ambien Laurie is freaking hilarious and makes me wonder what this drug is supposed to do because it didn’t seem to help her sleep! I enjoy L Another fun book from Laurie Notaro! The chapter where she realizes that size M and an L are very different and her dressing room antics had tears running down my face! I enjoy Laurie’s sense of humor its sardonic and sarcastic and I can relate to her very well. Laurie’s books are fun and will make you laugh if you like sarcastic humor. As usual Hilary Huber does a great job at the narration! I did not actually read this. I listened to the audiobook and I've made it through about half of the first disc. And now I am abandoning it. DO NOT bother with this crap. First an essay about trying on a shirt and how she can't get the shirt off because she's too fat? And now the next essay is about having woken up in a hotel room with snack packaging around her and she's unknowingly bought some cute shoes online in the middle of the night? I absolutely HATE women like this and will not be listen I did not actually read this. I listened to the audiobook and I've made it through about half of the first disc. And now I am abandoning it. DO NOT bother with this crap. First an essay about trying on a shirt and how she can't get the shirt off because she's too fat? And now the next essay is about having woken up in a hotel room with snack packaging around her and she's unknowingly bought some cute shoes online in the middle of the night? I absolutely HATE women like this and will not be listening to one more sentence of this. Yeah, all women do is eat and shop. I am going to stop this book right now before I have to hear something about RELATIONSHIPS, for godsake! 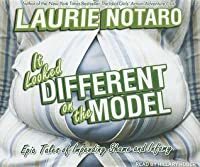 I've read other stories by Laurie Notaro, and while some of them are quite funny, a lot of them are stretched too thin. The title story is the best example. These are anecdotes. Some are clever, others, not so much. In the first essay, Notaro tries on a shirt that's too small, and gets her arms stuck. It could be a great sight gag on a sitcom, but it drsgs and feels forced as an essay. Also, it's hard to believe the hyperbole when she's a large trying on a medium. It's not like she was a manate I've read other stories by Laurie Notaro, and while some of them are quite funny, a lot of them are stretched too thin. The title story is the best example. These are anecdotes. Some are clever, others, not so much. In the first essay, Notaro tries on a shirt that's too small, and gets her arms stuck. It could be a great sight gag on a sitcom, but it drsgs and feels forced as an essay. Also, it's hard to believe the hyperbole when she's a large trying on a medium. It's not like she was a manatee trying to squeeze into a catsuit. I should probably stay away from this genre of self-deprecating humor. David Sedaris and Dave Barry can pull it off, but most everyone else is hit-or-miss. 3.5 - Some of the essays were hillarious and some were not that great. I felt like she was really stretching it on some of them and trying to hard (like the one where she lost her phone and the one about her mom sending e-mails to her). But, I will still read more of her stuff when she releases it. All, in all, this cements my view that, though her writing is funny, she can't touch David Sedaris. Worth buying but I'm glad I didn't pay full price.